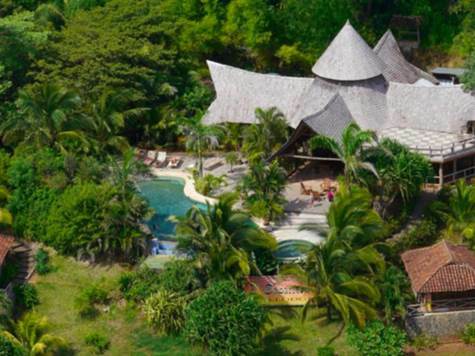 Unique opportunity to own a tropical and highly successful yoga retreat close to all Tamarindo area beaches! Over 10% ROI! This unique yoga resort offers 14 chalets built from local teak trees overlooking the picturesque Cañafistula valley. Each chalet includes queen size bed, private bathroom, air conditioning, fridge, safe, and a private porch. Common areas feature a beautiful open air lodge with kitchen and seating areas, indoor and outdoor yoga studios, Infinity pool and other hangout spaces, all equipped with hammocks and lounge chairs. New yoga shala recently constructed. Sweeping mountain and valley views from this beautiful 14,000 square meters of lush tropical landscaping. Near popular beach town of Playa Tamarindo in the tropical paradise of Guanacaste (northwest Costa Rica), The retreat/lodge is only a short drive away from 4 of the most popular and beautiful beaches in the area; Playa Avellanas, Playa Grande, Playa Negra, Playa Junquillal, and Playa Tamarindo. Some of the local attractions include zip lining, horseback riding, snorkeling, sunset cruise tours, surfing, Buena Vista Mega Combo, rafting tours, turtle nesting (November to January only), and many more. All can be arranged by the helpful staff during your stay. Advanced bookings well into 2018. Please contact listing agent for all showings.